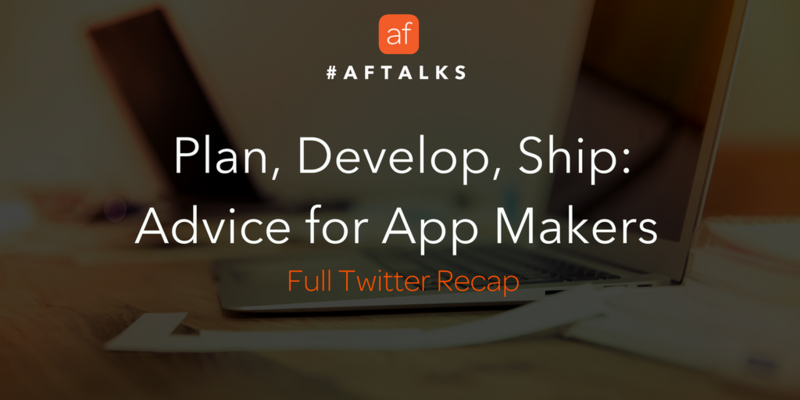 AFtalks is a new series of chats conducted on Twitter where we discuss the business side of building and selling apps. We’ve got a different topic/expert every week, and everyone is welcome to join the conversation. This week’s discussion revolved around the process of making an app–from planning an app to the actual development stage, to launching and keeping it successful. We hope that first-time developers get useful insight as they take on their new projects, and that seasoned developers can share their experiences and maybe even learn new tricks on how to improve their process. Q1: What kind of problem were you trying to solve with your app? A: We wanted our app to simplify analytics so that our users can get a high level overview quickly but also dig in deeper. Once we started designing we realized this is much harder to accomplish if we just “port” the way the site works. Q2: Did you go native, or cross platform? A: Native all the way! If you’ve seen/used the app you know it’s very interactive and full of animations. All of that required native code, and a few components built from scratch (like charts). However… that was two years ago, and for a very specific reason. Non-native is much more popular today. One good example of this is Unity, which is now being used to build 45% Android games. Q3: What advice would you give to a first time app developer when making design decisions on their app? A: Don’t be afraid to throw out your entire design, even if you invested a lot of time into it. Little known fact, we designed and built a whole app, then didn’t like it and threw it away before shipping. It cost us quite a while, but ultimately resulted in an app that’s much easier to use. Listen to users and find their needs. Create and test solutions. Choose one. Keep it simple. Don't stray far from Apple & Google. This includes: font sizes, colors, line thickness & icons. The problem is never the people it's the design. When someone uses a product "incorrectly" it's the product that is designed "incorrectly". Q4: What tips can you share for having a stress-free app submission process to the stores? A: Read and follow the guidelines! When we first submitted the app we got a metadata rejection immediately for having a link somewhere we shouldn’t. A silly reason for a launch delay. Also, plan extra time to go through review, so there won’t be a rush to launch on time. Q5: Your app is approved! What would you do next? A: We celebrated for a bit, then turned over to marketing and promotion. We got a good amount of traction early on from journalists, ProductHunt and from our member mailing list, and it was important to concentrate all at once. Then it was all about the numbers. We focused on downloads, active users, session length, and how they all work together. Q6: What is your go-to marketing channel for promoting your app? A:We’ve had a lot of success with our mailing list and Twitter ads. I’ve heard very different answers though from others. IMO the key is to map out all the channels you can use and pick the ones where the audience is most receptive. For example, a post in the right sub reddit might have a higher return than a paid Facebook ad. 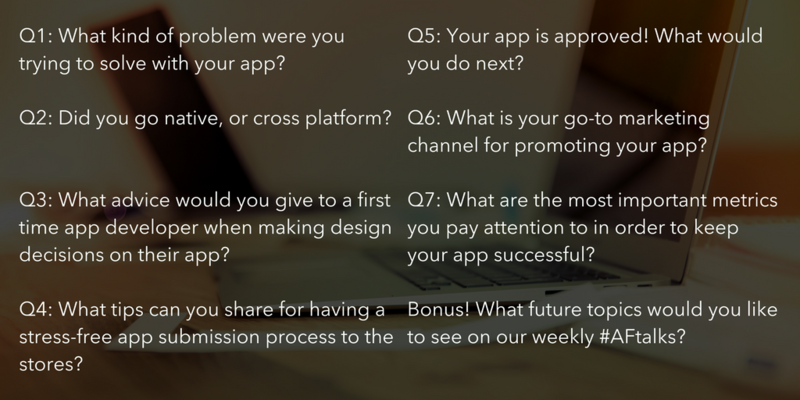 Q7: What are the most important metrics you pay attention to in order to keep your app successful? A: We look at a combination of things, starting with downloads and usage, and compare them to internal metrics like first-time logins, and how users engage with the app. Our latest update added real-time notifications, so tracking active users has been our focus. Recently 7-day retention is another important metric for developers, but depends a lot on your app. We spend a lot of time looking at the relationship between metrics and conversion rates over time. A huge thanks to our guest and to all those that were part of today’s discussion! Join us for our weekly Twitter chat every Tuesday at 1pm ET (and bring your friends!). See you all next week where #AFtalks about Monetization Strategies.